'Whilst there are parallels between this series and the political machinations of both House Of Cards and The West Wing before it, Sorrentino owes just as much to both The Sopranos and the gangland cinema of Scorsese'. The title sequence seen that opens most of the ten episodes in The Young Pope's first season sees Lenny Belardo (Jude Law), the titular pontiff known as Pius XIII, stride past religious artwork from across the centuries before turning to the camera to give a Frank Underwood-style wink to the audience. It's an isolated fourth wall break which initially suggests that the aim of Paolo Sorrentino's inaugural television series is to create a Vatican City version of Netflix's House Of Cards. Had the writer and director set out to do just that then The Young Pope would almost certainly have turned out to be a perfectly enjoyable watch. Whilst there are parallels between this series and the political machinations of both House Of Cards and The West Wing before it, Sorrentino owes just as much to both The Sopranos and the gangland cinema of Scorsese. That said, whilst the director is clearly happy to present the Catholic Church as being just as populated by unscrupulous and self-serving individuals as any large organisation, legitimate or otherwise, the series never becomes an attack on religion per se. On the contrary, Sorrentino offers a refreshing balance, highlighting the positive nature of worship upon people around the world in several episodes. Just as in life, faith is not the enemy here, but the people using it to further their own influence and agendas. 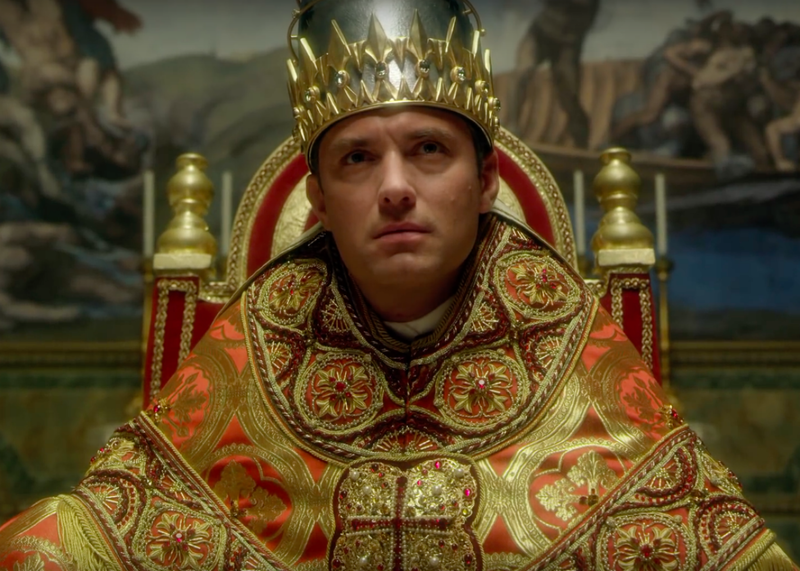 What sets The Young Pope apart from being just another story of Machiavellian power struggles are the regularly more surreal elements included by Sorrentino. From the first episode's opening dream sequence onwards, the director delights in keeping the audience guessing as to just how much of what we're seeing is actually happening and how much is in Lenny's mind. The Lynchian elements throughout keep matters compelling, even if they undoubtedly result in occasions throughout the series where you're not entirely sure of what is going on. The unorthodox narrative approach adopted by Sorrentino throughout has a similar effect, as the director regularly leaves some of his many plot threads untouched for episodes at a time. Whilst a few struggle to get the development they need over the ten installments as a result, almost all add something to the series overall - only one minor subplot feels surplus to requirements thanks in part to a cheap clandestine epilogue rather than a proper resolution. Helping to power through the relatively more bewildering and occasionally weaker elements is the consistently captivating performance from Law. The series' very best moments are those which showcase the actor's commanding presence as Lenny: his first address to the cardinals, his withering takedown of the Italian Prime Minister, and his many mordant exchanges with his Secretary Of State Cardinal Voiello (Silvio Orlando) amongst others. That Sorrentino's cast is littered with superb actors from across both Europe and the US, including Hollywood veterans Diane Keaton and James Cromwell, makes it all the more impressive that Law in the title role continually stands head and shoulders above them all. The Young Pope: Season One was released on UK Blu-ray, DVD and digital download on Monday 26th December 2016.